The death of Annette Funicello from complications from multiple sclerosis last week---a news item sadly over-shadowed by the announcement of Maggie Thatcher's death---must have pulled quite a few heartstrings in my generation both in America and in Australia. These days with such a range of entertainment options for kids on many TV channels and even more on the internet it's hard to imagine one TV show having the impact The Mickey Mouse Club did. When it started in 1955 there were only three television networks in the USA and little in the way of entertainment for kids. The cast of the show, the "Mouseketeers", were a group of singing and dancing kids. 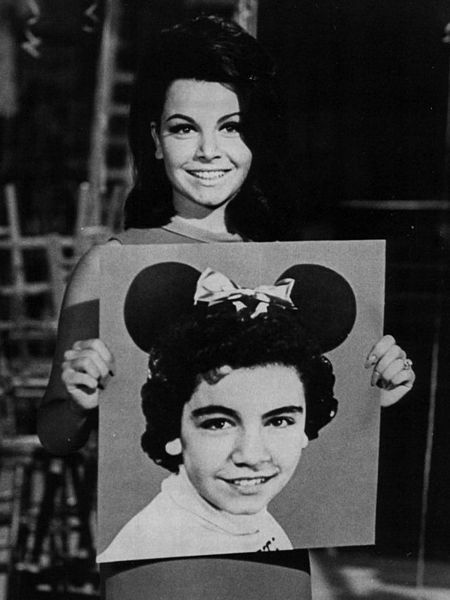 Annette was one of the originals and, by the end of the show's run, the longest serving of all of them. She sang and danced but it was her winning personality that came across on television that made her the darling of girls and boys everywhere the show was broadcast. I didn't know Annette. I never met her nor was I ever at the studio where the show was produced. 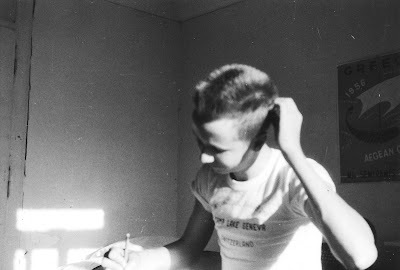 My appearance was entirely fortuitous and exceedingly brief. I was living in Spain in those days. There was no television and, even if there had been, I'm sure it wouldn't be broadcasting a show with American kids dancing around and singing songs about a mouse. 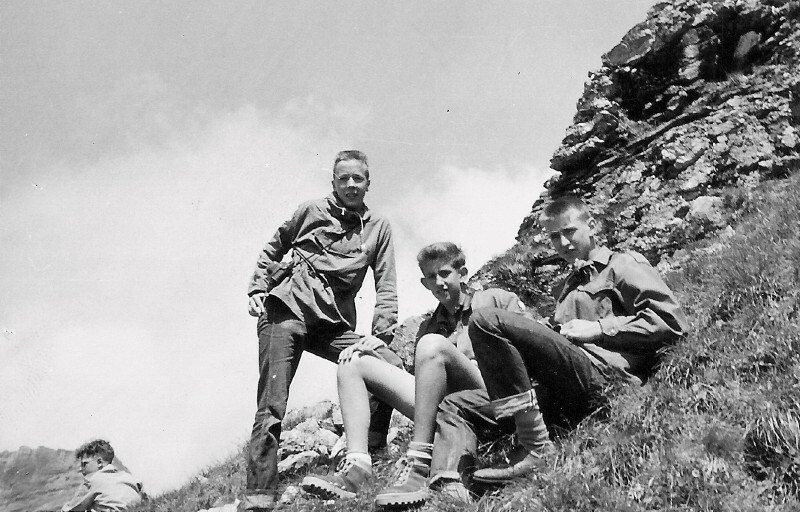 In the summer of 1956 I spent a month at a summer camp in Switzerland. We spent a lot of time hiking in the most magnificent scenery. On a climb up to les Diablerets Glacier a couple of outsiders came along. Al and Jerry (dubbed by us Tom and Jerry) were a two-man film crew from The Mickey Mouse Club. It was their job to come up with footage for the "Newsreel" segment of the show and we were their story for the couple of days they were with us.. 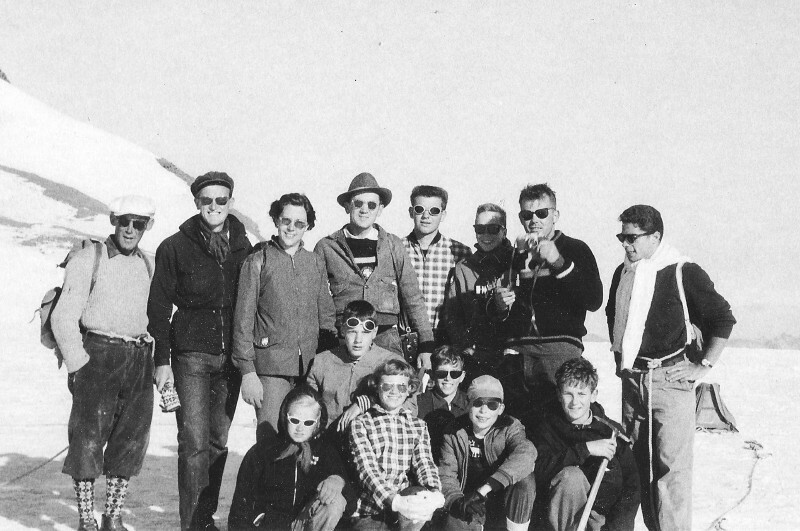 Happy campers, camp staff and film crew on les Diablerets Glacier. Me on the right with friends Michael and Danny. I spent a part of two summers at this camp and fell in love with the mountains. On another hike (pictured below) we got a taste of rock-climbing, a sport that I took up seriously a few years later. 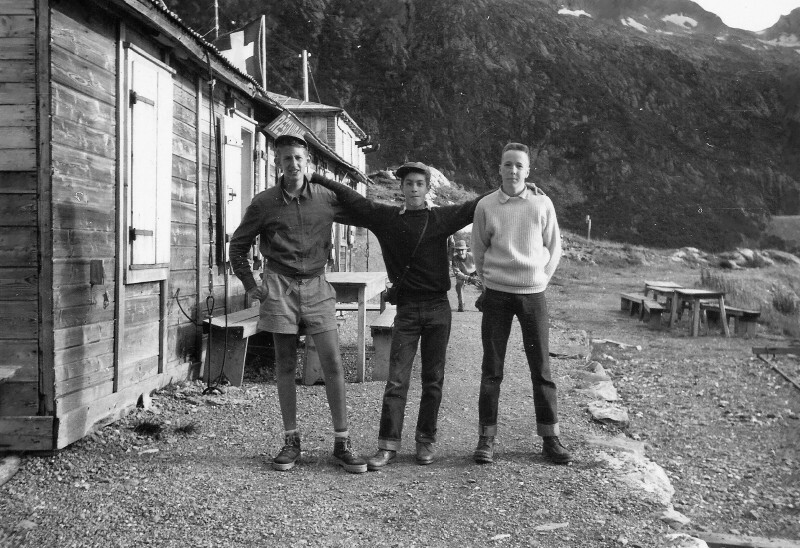 With Michael and another friend on the Swiss-French border. But back to Mickey and Annette: A year or two after the les Diablerets climb I was back in America and happened to be channel surfing when I came across The Mickey Mouse Club in time to hear Annette say, "And now to some news from our Mouseketeers in Switzerland". Hardly breaking news but there we were - a group of great friends looking happy and fit in a fantastic setting. Sad as it was to hear of the death of Annette Funicello it brought back wonderful memories. Editing "The Yodeler", the camp newspaper, and, as always, struggling to find the words. 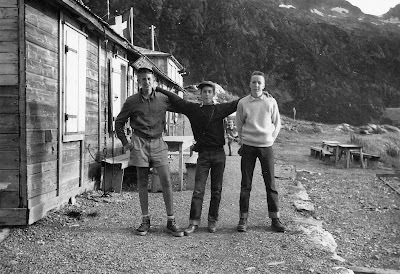 Footnote 1: I confess that I don't remember whether it was Annette who narrated the Newsreel or what whoever it was said but I think that our band of happy campers were dubbed "Mouseketeers". Footnote: 2: I've spared you the story of the light plane that crashed on the glacier just before we got there and our watching the subsequent rescue of the injured pilot by another daredevil pilot. Footnote 3: On the far right in the photo is Tom, the only one I had any contact with after that summer. He was a Harvard student at this time but later worked as some sort of secret agent and died in mysterious circumstances. The girl in the middle of the front row with her hands on her knees was my girlfriend, Robyn.